What if you didn’t brush your teeth for the first 30 years of your life? Without preventative care, by 4 years of age most dogs and cats have significant dental disease. Yearly cleaning throughout life should be planned for. Some animals, just like some people, have worse teeth (diet and genetics play a role) and need more frequent cleanings. Having your pet's teeth cleaned often will reduce the amount of damaged, loose and rotten teeth that have to be extracted later. Our dental suite is equipped with two dentistry tables, anesthetic machines and monitoring equipment. All the probes, scalers, extractors, drills and polishers that are used in human dentistry are used here. 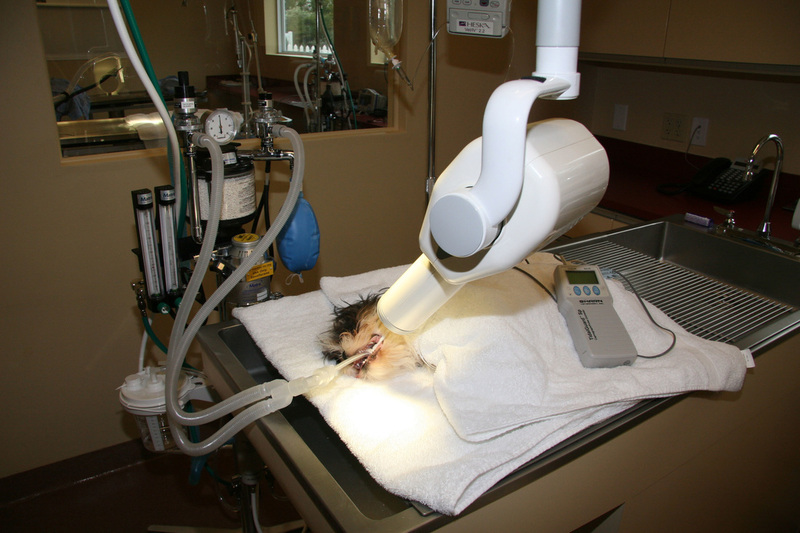 A dental x-ray machine is available to check for broken roots, tumors and other problems. Pain medication and antibiotics are given when needed, of course. There are many tools and techniques for at-home use for you to help prevent dental disease in your pets. Our technicians would be happy to help you learn how to care for your pet’s teeth.